After sleep, how can you ‘get up’ before ‘opening eyes’? 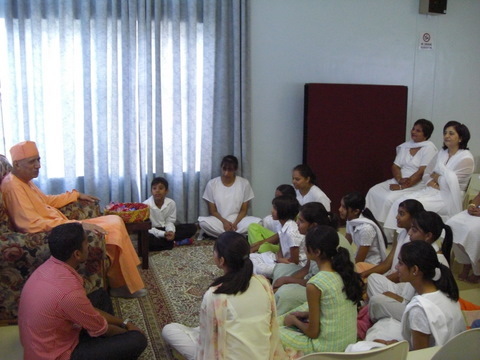 During my Northern Natal tour in connection with the Swamiji’s birthday celebration, I had a refreshing meeting with youngsters of Ladysmith Branch of Ramakrishna Centre of South Africa on 10th January 2008. All of them along with their parents were volunteers and had worked very hard to organise the next day morning meeting in the Civic hall. A little more than 800 people were expected to attend where my key-note address was scheduled. Though they were eager to continue the discussion in that late night, I felt that I could cut short of my discussion to give them a reprieve from the tiresome work they put up practically the whole day. In order not to disappoint them, I asked them to field questions. All were, unlike the other days, silent (shy? or tired?). So I raised this query and asked them to keep the reply ready when I would meet them on my return trip from Dundee on 14th January. My query to the young members was this. One of the oft-quoted line of Swami Vivekananda is ‘Arise! Awake! And Stop not till the Goal is Reached!’. We normally see that after the night sleep, we first ‘wake up‘ – ‘open our eyes’ and then only ‘rise up‘ – ‘get up’ from our bed. 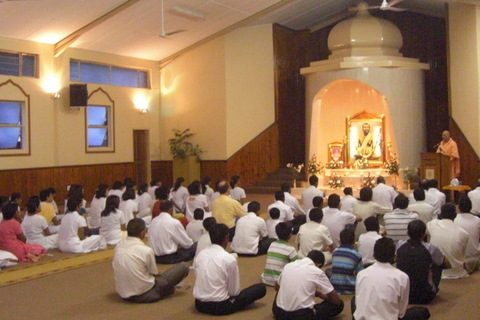 But Swamiji strangely calls up first to ‘Arise!’ and later to ‘Awake’. Is it not a contradiction to what we are used to? Would Swamiji, being the ‘nitya siddha’ – the Ever Perfect, make such a silly mistake? No, the youngsters in one voice said, no, it cannot be a mistake. Then, I asked: what does this mean? Arise! Awake, could also mean, Arise from this weakness, stand up and proclaim that God that is within us. As Swami Vivekanada says we must de-hypnotise ourselves, as too much of inactivity and weakness has been cast on the human race. Swami Vivekananda calls on the human race to awaken the “sleeping soul” to rejuvenate the Spirituality within. I will be honest and truthful in writing that I AM FEELING LIKE MY THIRST IS ENKINDLED OR AROUSED TO UNDERSTAND THIS TEACHING OF SWAMIJI…. It is really suprising that EVEN AFTER READING THIS TEACHING OF SWAMIJI, THIS THOUGHT HAS NEVER OCCURRED IN OUR MIND ABOUT THIS PARTICULAR FACT….I HUMBLY REQUEST YOU TO PLEASE EXPLAIN THIS MOST IMPORTANT COMMANDMENT…..
Having read the quotation numerous times at different places it was surprising to see it in a new light. The saying, “Arise! Awake! And stop not till the goal is reached!” has always sounded right. At first sight it does seem to be slip but we all know Swami Vivekananda couldn’t have made a mistake. I think to understand it fully one needs to go through the whole speech from which the line was picked. My take is the lines were directed to the youth and the people in general. “Arise” here asks the youth or the men to rise themselves from their spiritual inaction or slumber. It also urges them to stand up against wrongs and to take action. “Awake” here urges the arisen youth and people to awaken others who are still in the state of ignorance and are spiritually dormant. Because it is the duty of the enlightened one to enlighten others who are still in the dark. If knowledge is not shared it has no use. So we must first Arise ourselves and then awaken others; and we should not stop till our goal of global spiritual awakening is not reached. Because that is the only way a common consensus can be built among all kinds of people and only then problems facing our country, our society… our world can be solved.